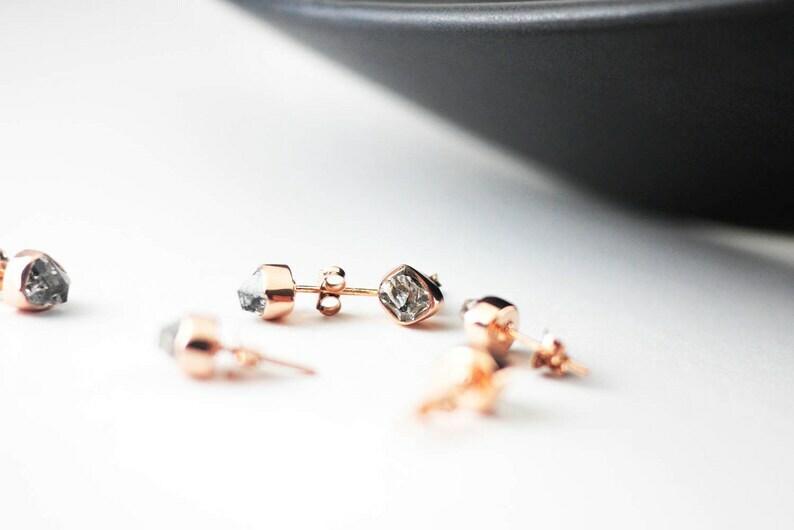 The Herkimer Diamonds in these stunning stud earrings are hand selected for best quality assurance, then precisely sawed and shaped into the desired geometry. The precious stones are then delicately grinned , sanded and hand polished to make sure each stud has the perfect aesthetic. [IMPORTANT]: Because each stone is 100% natural they each feature a unique color and pattern design. Some stones may be lighter or darker in color. If you have a specific stone color variation let us know. However, that is the beauty of nature, no one item can be the same. ▸Every item comes with a ZUMARI pouch! ▸ CLEANING Gold-Over-Silver Jewelry: To clean gold plated jewelry wipe lightly your gold plated piece with a damp cotton cloth to remove surface dirt or dust. Be sure it is completely dry before storing the jewelry again. Keep your gold plated jewelry in a separate jewelry box or place it in a soft cloth after cleaning to avoid any blemishes. Enjoy 15% OFF all of our pieces! These are incredible, beautifully made earrings. I'm really happy with my purchase. I love the rose gold. They are just big enough and pair perfectly with my real diamonds earrings on my second percing. Very pretty..they go nicely with my other piercings. 1. Substances like oil, nail polish, nail polish remover, chlorine, perfume and the like may react with metal/plated jewelry and will cause it to tarnish easily. This also goes with sweat, so make sure you don’t forget to remove your gold plated jewelry when you exercise or anything that would require heavy physical work, and also when swimming. 2. Do not spray on perfume or other sprays while wearing your gold plated jewelry. Wear your jewelry after you have sprayed on your favorite perfume so that chemicals on the spray or perfume does not interact with your jewelry’s metal. 3. Stay away from jewelry cleaners and antibacterial soaps which may have certain components that will just make your gold plated jewelry tarnish more quickly.